What Can I Do If I Have No Headboard for My Bed? If your space is cramped, you need to make sure every bit of space is used productively and that all your furniture fits. If you're thinking of buying a new full-size bed, measure it so you know it will work in the space. Most full-size or double beds are 75 inches long and 54 inches wide. There may be variations if you have an antique bed or long double bed. Measure your bed to make sure it fits. Place the measuring tape on the floor. Bring up the tape until it reaches the top of the full-size bed. This is the height of the bed. Place the measuring tape on the bottom right-hand corner of the bed. Stretch it across the bottom of the bed, keeping it even with the end of the bed until it reaches the bottom left-hand corner. This measurement is the width of the bed. Place the measuring tape on the bottom right-hand corner of the bed. Stretch it across the side of the double bed, keeping it even with the sides of the bed until it reaches the upper right-hand corner. This is the length of the bed. Place the measuring tape on the outside of the top right corner of the footboard. Stretch the tape until it's on the outside of the top left corner of the footboard. Keep the tape on the top edge of the footboard as you stretch it across. This is the width of the bed plus the footboard. Place the measuring tape on the outside top right corner of the headboard. Stretch the tape until it reaches the left outside corner. Keep the tape even with the edge of the headboard as you measure. This is the width of the bed plus the headboard. Place the tape in the center of the headboard on the back outside edge. Stretch it down the center of the bed until it reaches the center of the footboard's back outside edge. This is the length of the bed plus the headboard and footboard. You may need a helper to assist you in stretching the tape across the bed, headboard and footboard. The headboard may be wider than the footboard, so measure both. 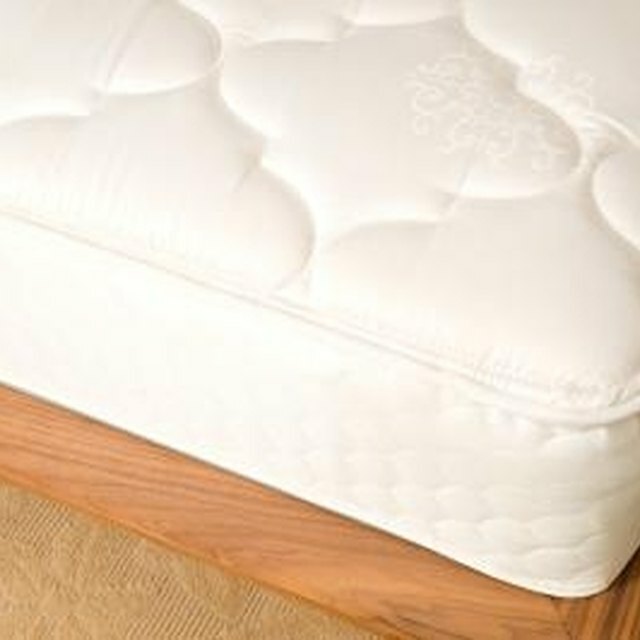 What Are the Benefits of Tempur-pedic Mattresses?